A monument for Nuchi du Takara has been built in front of the Cornerstone of Peace at the Okinawa Prefectural Peace Memorial Park in Mabuni, Itoman. June 9. 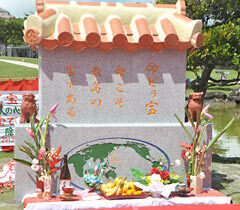 On June 9, in front of the Cornerstone of Peace at the Okinawa Prefectural Peace Memorial Park in Mabuni, Itoman, an unveiling ceremony was held of a stone monument for world peace. The words “Nuchi du Takara (Life itself is our treasure)” are inscribed on the monument. About 30 people involved in erecting the monument celebrated its completion.